SS Rajamouli’s Baahubali is one of the biggest film franchise of the Indian film industry and the two films took nearly five years to complete. Now that Baahubali 2 is about to land in a few days, the whole team, and especially director SS Rajamouli, has been talking about the complete dedication the film’s Baahubali, Prabhas, showed towards the project. Prabhas plays the double role of Amarendra and Mahendra Baahubali and gave up over four years of his life to the film. Ace director S.S. Rajamouli expressed his gratitude and love for Prabhas with a gift. Do you guys remember the iconic Baahubali armor? Yes! Rajamouli gave the armor to Prabhas as a token of appreciation and love for all the hard work put in by Prabhas. When one thinks about the Baahubali series, the first person who’ll come into every person’s mind would be Prabhas. In a recent interview, Rajamouli mentioned that he is eternally grateful to Prabhas for believing in the project and for supporting him without even questioning a single choice made by him. It is very rare to see an actor working on a single project for such a long span of time. Rajamouli also mentioned that Prabhas became a very dear friend to him in the course of these 5 years. Apart from Prabhas, the next person who made this series a Masterpiece would be Rana Daggubati. Both Prabhas and Rana worked rigorously and made sure they had what it takes to be a part of the Baahubali series. Prabhas and Rana managed to maintain the hefty physique all the way. Prabhas, who was actually weighing 82 kgs, bulked his body up to 105 kgs! Isn’t it overwhelming to see such passion and love for a cinema? He turned out to be an inspiration for every aspiring actor. Prabhas did not sign even a single project in these 5 years. He believed in Baahubali and just went with the same flow. 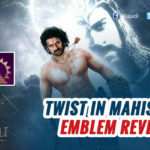 Produced by ARKA entertainment, Directed by S.S Rajamouli, The movie stars Prabhas in the titular role in addition to Rana Daggubati, Tamannaah Bhatia, Anushka Shetty and Satyaraj in pivotal roles. The film is slated to release on 28th April, 2017.